After my last visit to Yamakase I told Stan and Yama-san that I would be back the next evening. So maybe that was intoxication talking, but another trip was definitely in order. This time around we decided to book the entire restaurant a la Urasawa. 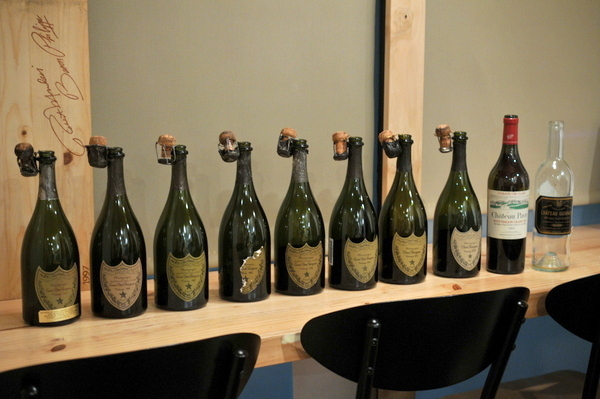 Our last trip here was an early New Years Eve celebration replete with plenty of champagne. 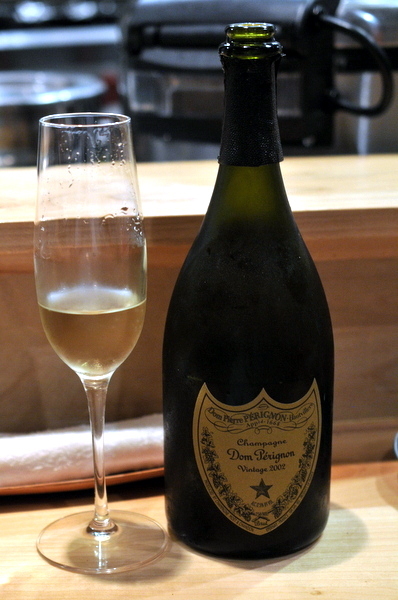 Round two brought even more champagne with a vertical of Dom Pérignon as well as a Bordeaux for the beef and something sweet to finish. 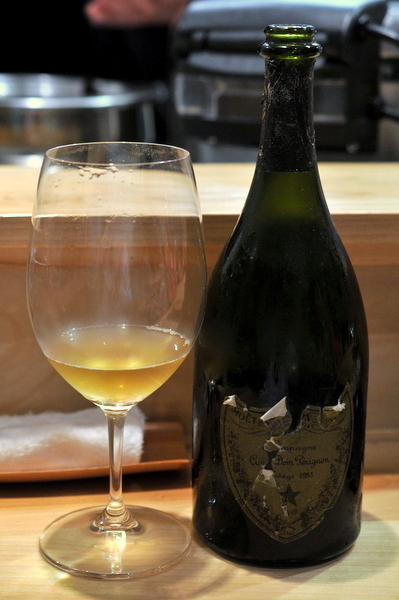 This was the oldest of the champagnes we brought, this wine was definitely showing its age. Molten gold in color, this wine offered faded notes of hazelnuts and coffee overshadowed by oxidation coupled with residual sugar that caused a number of people to liken this to a dessert wine. While Yama-san was prepping I noticed that there were four or five cartons of uni so I suspected we'd be seeing the stuff early and often throughout the meal. 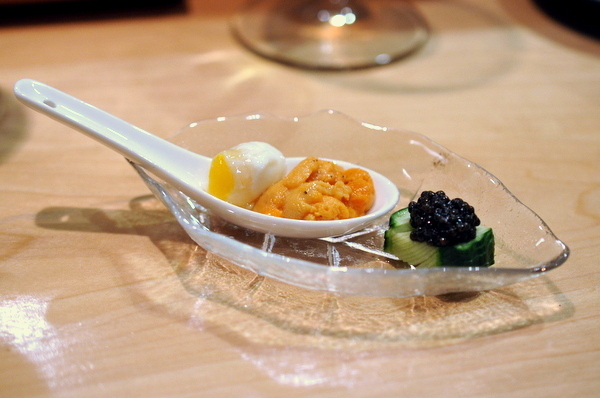 First up, we had a spoonful of immaculately sweet and creamy urchin roe mixed with an equally soft quail egg then topped with a pinch of truffle salt. The warm egg had a nice temperature contrast and seemed to restrain the uni on the start leading the subtle aroma of truffle to the fore with a creeping sense of brine on the finish. Where the spoon was rounded and gentle the caviar and cucumber proved to be a starker contrast of lusty salinity with refreshing crispness. What a difference two years makes, the '80 still shows some sherry-like character but also offers butter and toasty notes with some earth and overripe apples as well as a short lived acidity and effervescence to give the wine some lift. Next up was a trio of sashimi paired with special seaweed from Naruto Japan. First up the Kisu or Japanese Whiting came lightly seared imparting a subtle sensation of savor to the otherwise mild fish. Given its rarity, I'm always pleased to see Tairagai, also known as Pen Shell Clam or Half Moon Scallop the texture is firmer than a regular scallops but stops short of being snappy while the flavor couples slight smokiness with the classic shellfish sweet brine profile. The Aoyagi was surprisingly mild and tender with an intense sweetness in place of the harsh brine that I typically associate with orange clam. Next up was two spoonfuls of a special tofu from Kyoto. 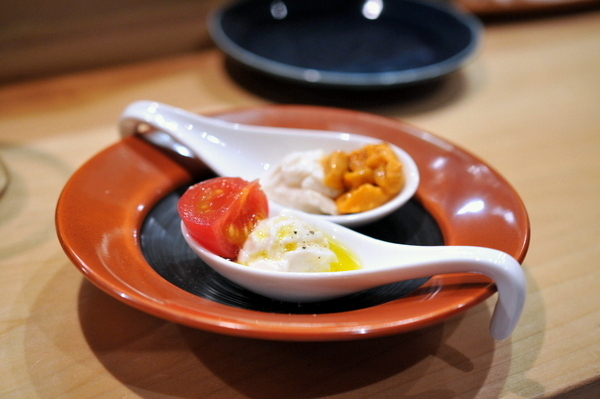 The first spoon was a take on an Insalata Caprese with the tofu standing in for the Mozzarella. A specially marinated tomato headlines the dish, the dense fleshy sphere was imbued with a forceful yet harmonious acidity that deftly complimented the floral tones of the olive oil and nutty undertones of the dense creamy tofu. Surprisingly I preferred the finesse of the salad to the combination of tofu and uni which seemed more like a classical pairing with the uni dominating the match. 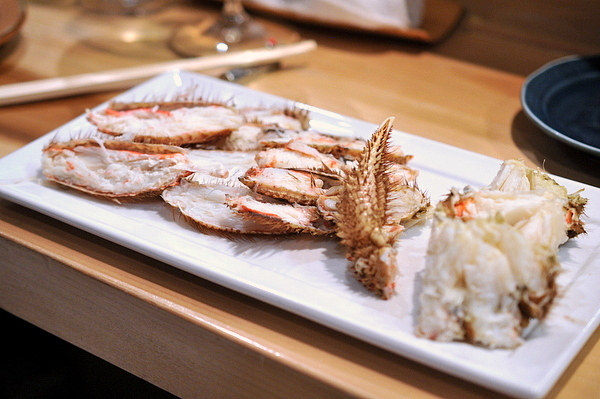 While it might not sound like the most appetizing thing, crab guts make everything better and this was no exception. The pristine fleshy pieces of snapper are a lovely study in texture, particularly the belly piece at the bottom, but the fish definitely needed a bit of augmenting in terms of flavor making the livery sweetness of the crab guts a fitting accompaniment the sashimi. 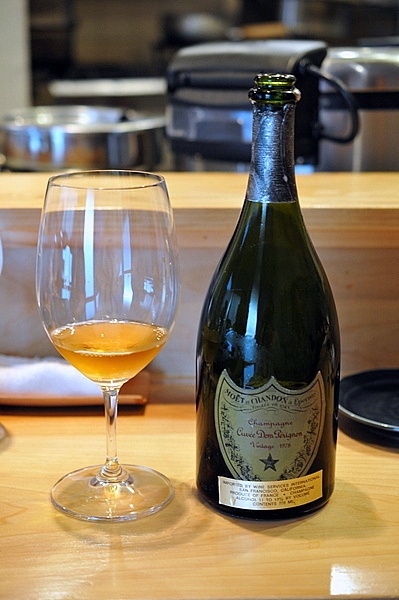 Remarkably similar to the '80, with perhaps a bit less on the toast and butter and an added twinge of almond and honey. Enjoyable but I was hoping for a bit more complexity from my birth year Dom. 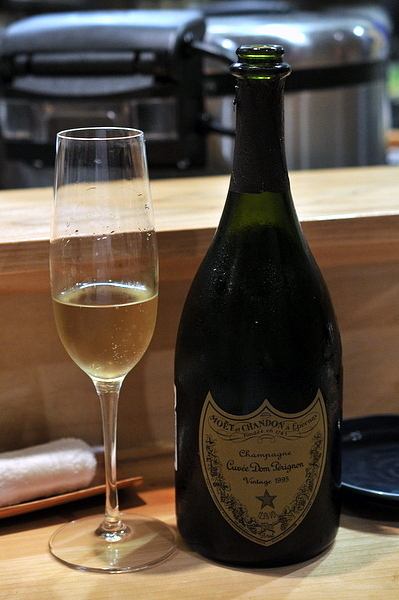 Like its older siblings, the '82 had some fine bubbles when poured but they stilled quickly. With their unrivaled sweetness and dense body Kusshi's are probably my favorite oyster right now. 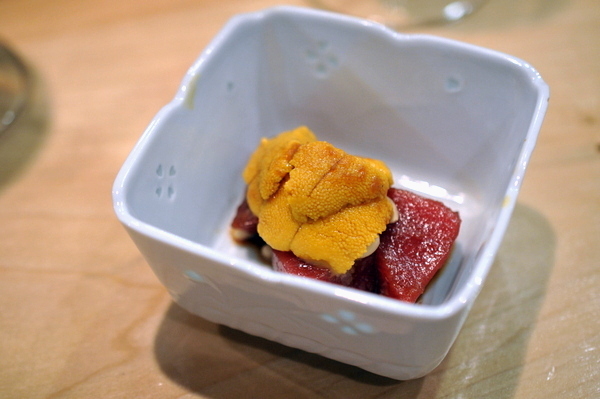 The pairing with uni was absolutely beautiful with an immediate concentrated brine mixed with a lively sweetness from the yuzu and finishing with a lingering melon-like sweetness. The second spoon was a bit heavy-handed this time around thanks to the addition of sesame sauce which blunted the nuanced flavors of the oyster. Earlier in the night we saw Yama-san drop two prized Hokkaido hairy crabs into a pot and it was finally time to see the fruits of his labor. 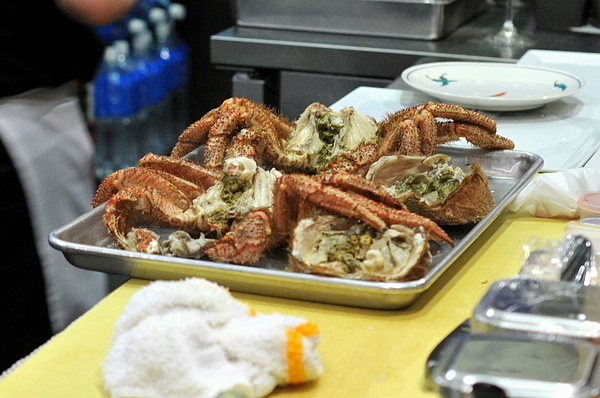 Fittingly, Yama-san served these pretty much without any adornment so the crab could stand on its own. Valued for their especially sweet flesh, I have to say I fail to see what all the hype is about. The meat did have some good flavor but I wasn't wild about the texture; certainly not the end-all-be-all of crab that I was expecting. Aromas of toast were immediately apparent in this bottle. This wine had more apparent fruit notes, bitter lemon and a touch of orange blossoms coupled with secondary savory notes of smoke and slate. 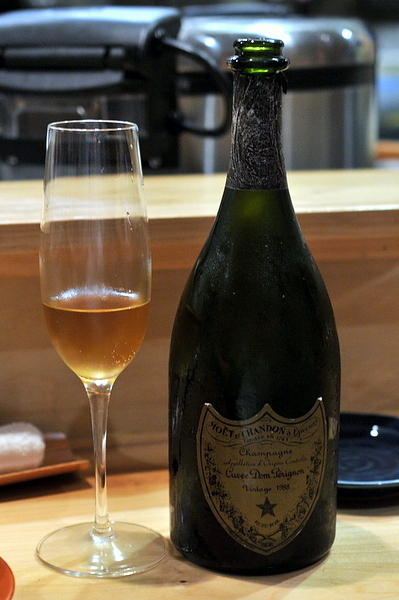 Straddling the line between fresh youthful champagne and deeper more mature vintages, this was my favorite of the tasting. 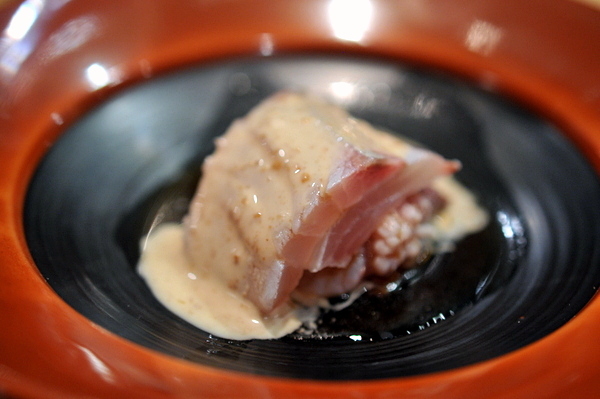 Hamo or conger eel is a summer delicacy in Japan. Filled with tiny bones, hamo requires a special knife called a hamokiri (hamo cutting) knife with incisions made every 2mm to sufficiently tenderize the flesh. After cooking, the meat takes on a firm spongy consistency that is quite unique though personally I thought the accompaniments were actually better than the fish. Hamo is often served with a pickled plum paste which Yama-san replaced with supple ume-soba noodles while a clear broth filled with fragrant junsai and Japanese chives adds a tranquil homey warmth to the mix. Despite being 10 years younger than the '78 this was even darker with an almost amber cast to it and I thought the wine was correspondingly faded on the nose and palate; prematurely aged for a mere 25 year old. 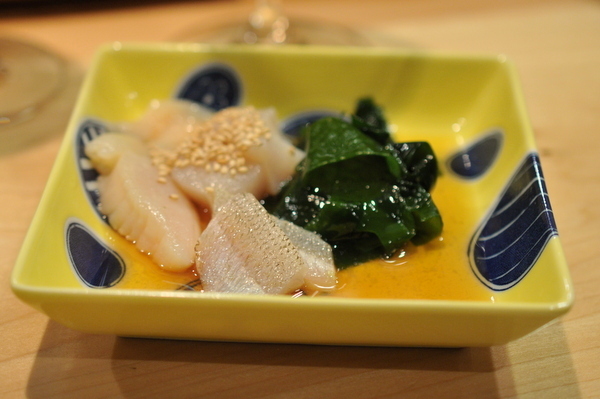 Yama-san quickly dipped the slices of Amberjack in boiling water heightening the supple snap of the fish. The contrast between the creamy sesame dressing and tangy ponzu was a nice flourish to compliment the nuanced oily nature of the fish. I had a similar course during my last visit but this time around Yama-san kicked things up a notch with the addition of yet more uni. The tactile sensation of biting through the thick cuts of maguro are an absolute joy; the culinary equivalent to lying on silk sheets. Already seasoned with plenty of soy, the uni adds an extra layer of flavor while the pine nuts add a pointed if ephemeral nutty counterpoint. Jumping forward almost a decade, the 1995 was firmly on the youthful side of things. 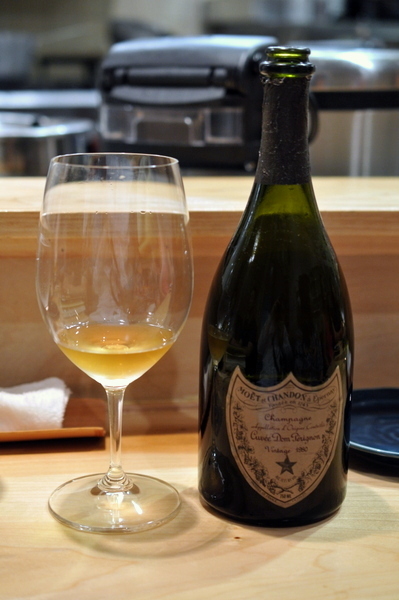 Faint toasty notes were matched with a perfume of citrus and white flowers wrapped around a taut core of acidity. 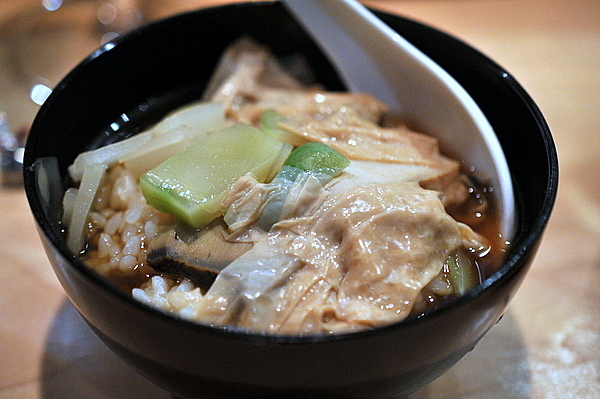 A more conventional chawanmushi than my previous visit. The flavors were a bit more refined with a restrained earthy brine permeating the silky custard thanks to the troika of scallop, crab, and uni. 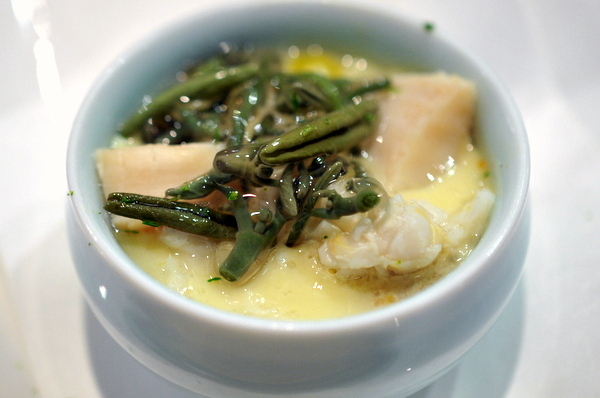 Still slightly translucent, the steamed snapper still retained some of its characteristic firmness and gained a light salinity. 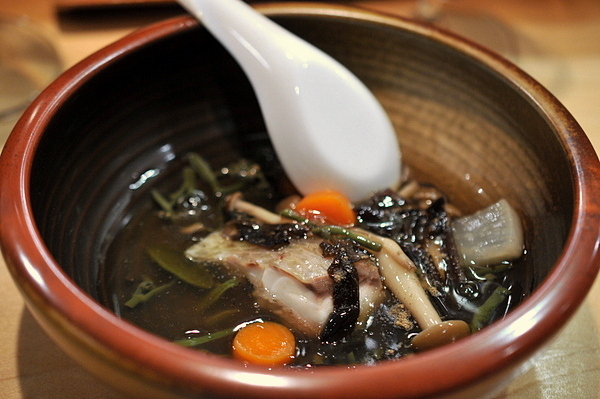 Seasoned heavily with sansho, the "gravy" had the spicy bite and consistency of a hot and sour soup as well as a slight earthy twang from the junsai and mushrooms. Almost creamy on the palate, this wine had a more defined bouquet of fruits than its predecessor, with clear crisp apple, candied lemon, juicy apricot, and even some tropical flair appearing as the wine warmed. My friends and I dubbed this creation the Tokyo cheesesteak. The tataki retained a soft silky consistency and just the right amount of savor from the quick sear. A blend of sweet crab and fragrant luscious truffle cheese give the dish a welcome touch of extra luxury. 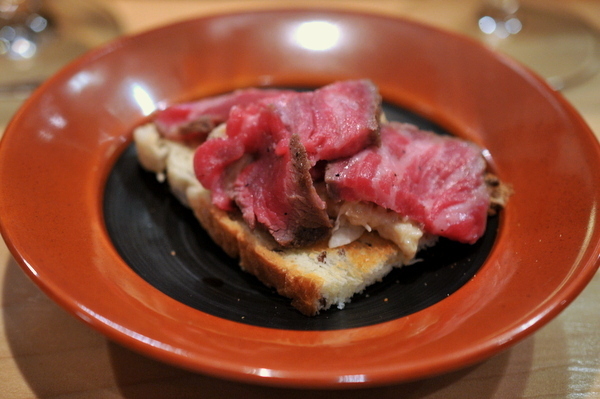 The Kagoshima beef was one of the highlights of my previous visit. This time around Yama-san cut the steaks a bit thinner so while the beef was still amazingly soft and fatty some pieces were a touch overcooked for me. 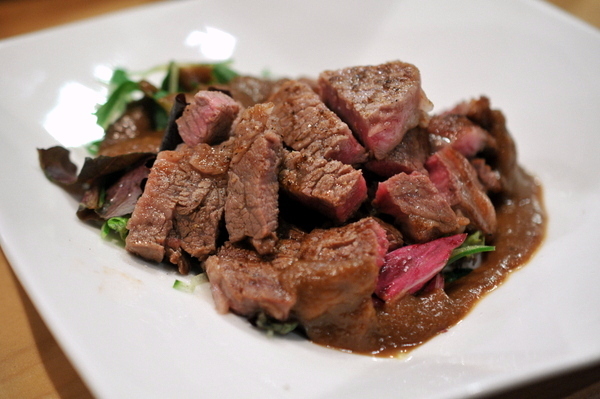 The beef came resting on a bed of greens which added a nice contrast though I would have preferred it if the dressing was on the side since I thought it detracted from the pure beefy goodness of the steak. 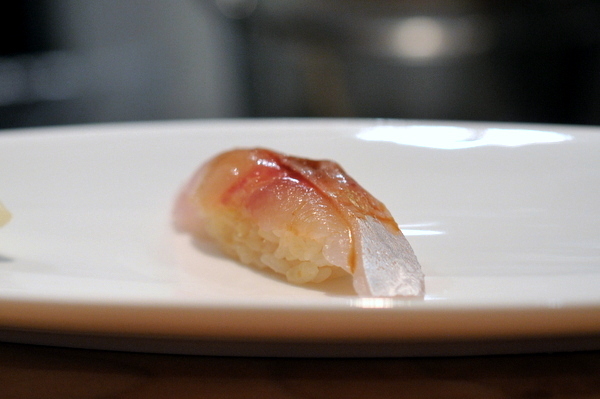 Moving onto nigiri we started with a piece of chu-toro. Straddling the line between akami and toro, this had some of the textural nuance of the former with the fatty indulgence of the latter. I can see why this vintage causes so much controversy. 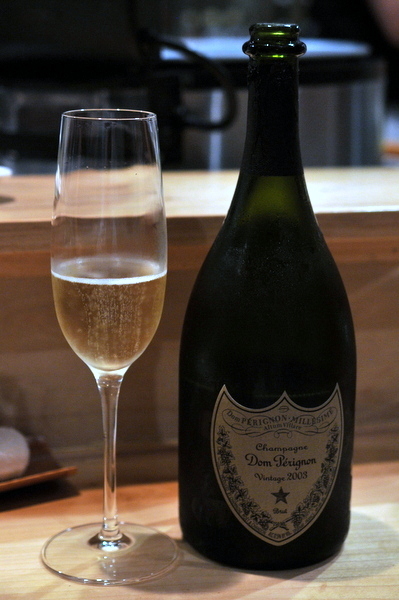 Made from an unseasonably warm early harvest, the wine is lean and taut with an inscrutable aspect that definitely doesn't fit the classic profile of the preceding champagnes. Forget the restraint of the previous piece. this was like eating solidified fish oil finished with a kick of wasabi and an earthy musk of truffle. 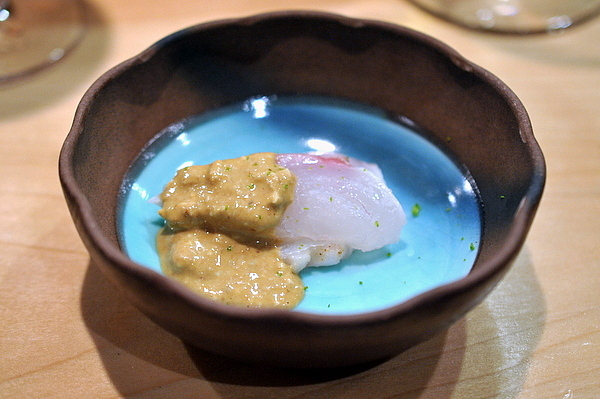 Yama-san described this as a special Mackerel only found in two places one of which was Kyushu. The fish was remarkably mild despite the oily sheen and lithe supple texture. This was a surprise Kevin brought from his personal stash. The cork showed some worrisome signs of compromise but the dark amber liquid was still quite enjoyable. Unlike younger Sauternes this wasn't overly sweet. 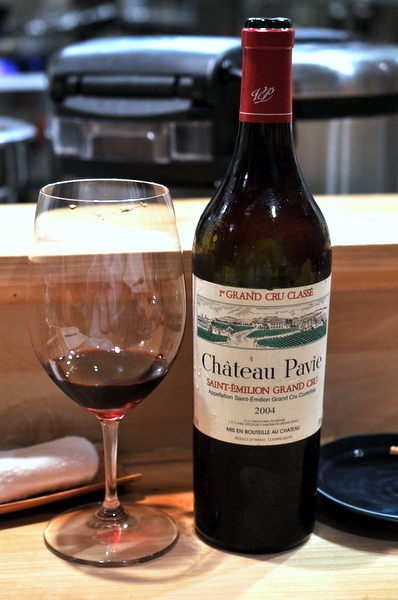 Restrained notes of caramel, honey, and tropical fruit are met and countered by a lively acidity on the finish. 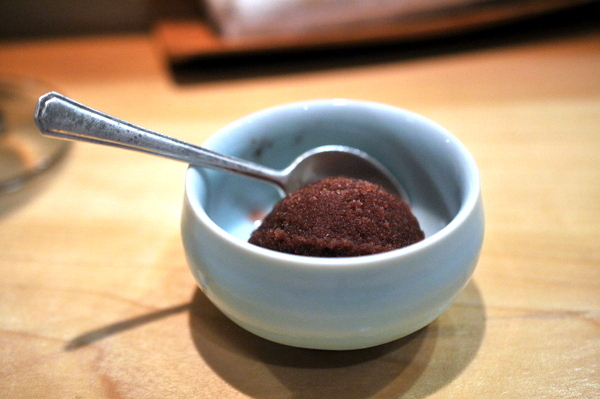 Dessert was almost an afterthought in comparison with the elegant savory courses, but the piquant tang and bracing chill of the plum sorbet were quite refreshing after all that seafood. No idea what kind of caviar this was, but I wasn't about to refuse when the chef started handing out spoonfuls of the stuff. 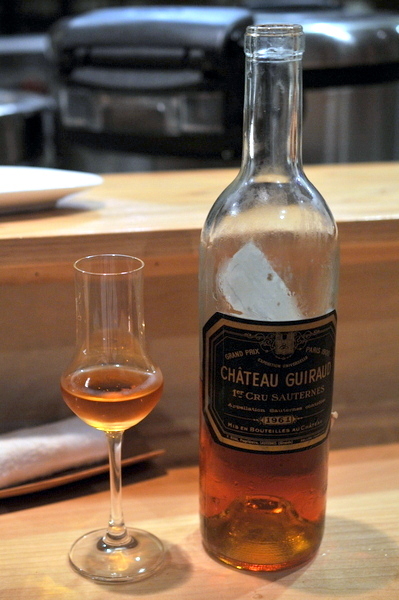 The unbridled salinity of the fish eggs was a fantastic contrast for the '61 Guiraud. 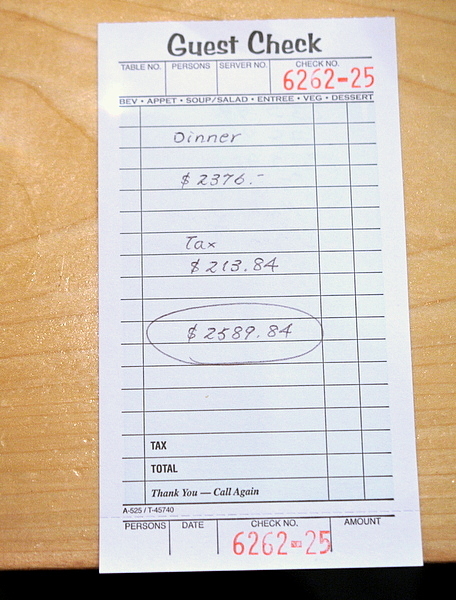 Despite my relative sobriety this time around, the meal was no less fun for it. 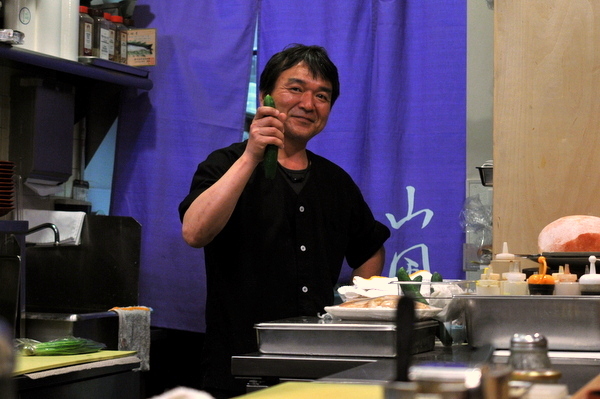 Unlike the archetypal stern sushi chef a la the Sushi Nazi or Keizo Seki(Sushi Zo), Yama-san is quick to smile and likes to crack jokes; frequently at his own expense. Stan was also on hand and the genuine warmth he brings to the dinner service only heightens the restaurant's relaxed and inviting atmosphere. Yama-san says eat your vegetables! 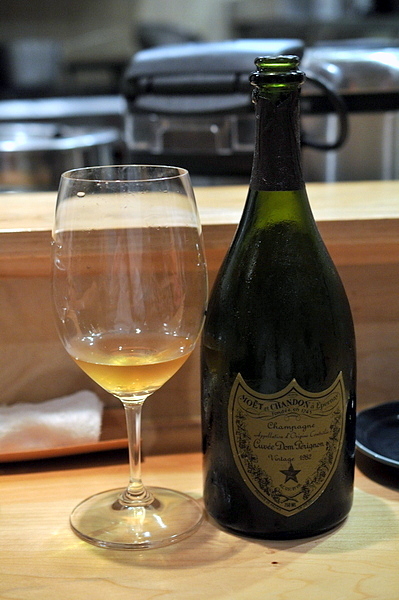 My first visit to Yamakase was one of my best meals of 2012, though I freely admit the night's drunken shenanigans may have unduly influenced my opinion. I actually managed to remain sober this time around giving me the opportunity to more fully appreciate Yama-san's cooking. While I was more critical on a number of dishes this time around, the majority of the dishes were still superb. A self-taught chef, Yama-san's style feels a bit more homespun and authentic, with a bolder less restrained feel than his peers. The only complaints I could see with Yamakase have more to do with the mechanics of the meal rather than the cooking itself. First is the relatively limited selection of seafood available at any given meal and the inevitable repetition that comes with it. While I would like to see Yama-san work with a wider palette of ingredients he certainly makes the most of the pristine seafood he has on hand. 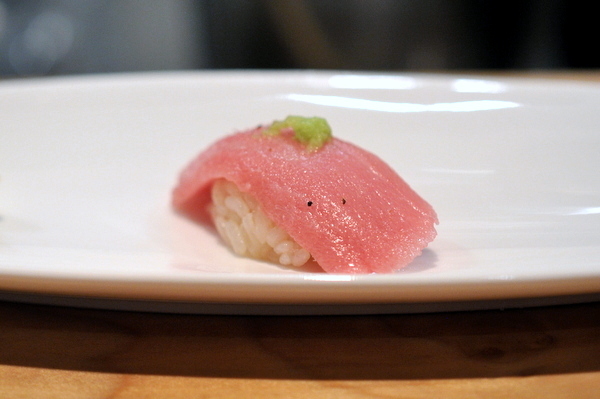 The second nitpick had to do with the relative lack of nigiri. While I would have liked to have more of Yama-san's delicious nigiri, there are plenty of great Edomeaezushi-focused restaurants. 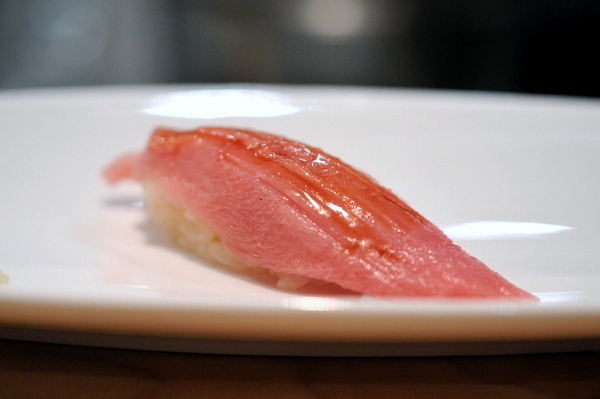 When coming to Yamakase just sit back and let the chef work his magic; you'll be happy you did. 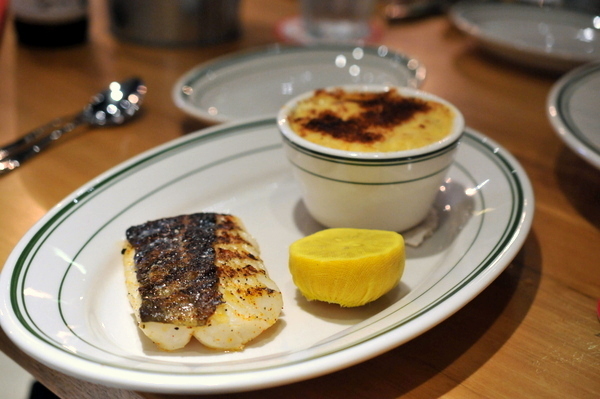 Something of a genius when it comes to seafood, Cimarusti's Providence has been the go-to place for seafood fine dining in LA ever since it opened in 2005. 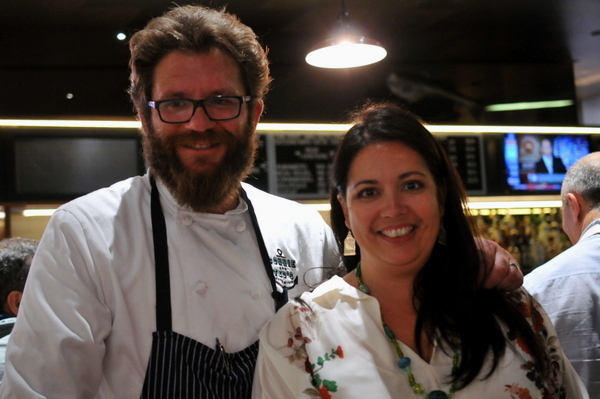 Naturally, when I heard he was opening a new restaurant I knew I had to be there on opening night. 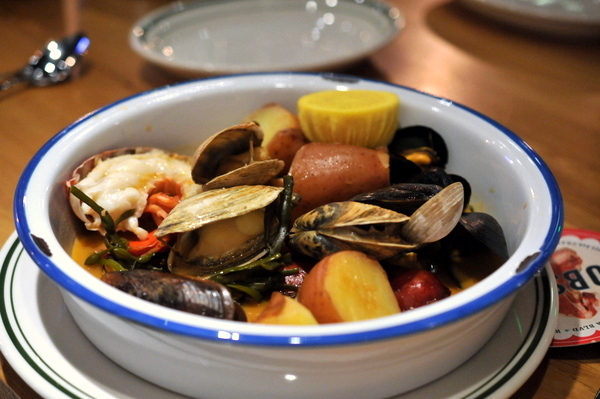 Named for his maternal grandparents, Connie and Ted's focuses on simply prepared fish and shellfish done in classic New England style. 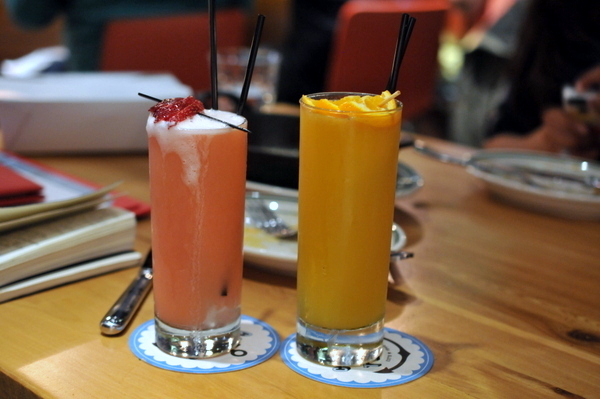 Housed in the heavily renovated former home of the Silver Spoon, Connie and Ted's has a modern yet casual feel that is at odds with the down-home inspiration for the restaurant. 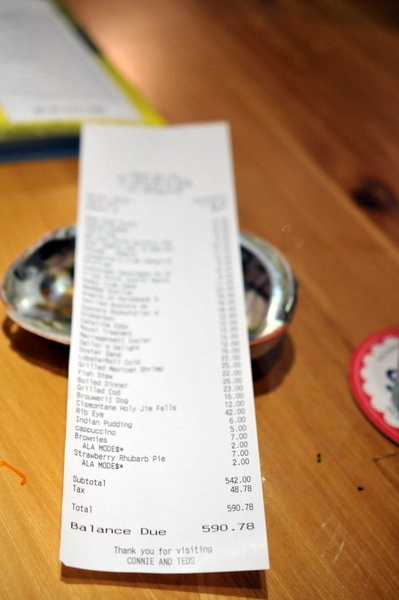 With 19 types of oysters to choose from, we opted to take the easy way out and let the chef decide. Though we told our waiter we wanted 6 varieties instead of the usual 12 so that everyone in the group could have one. 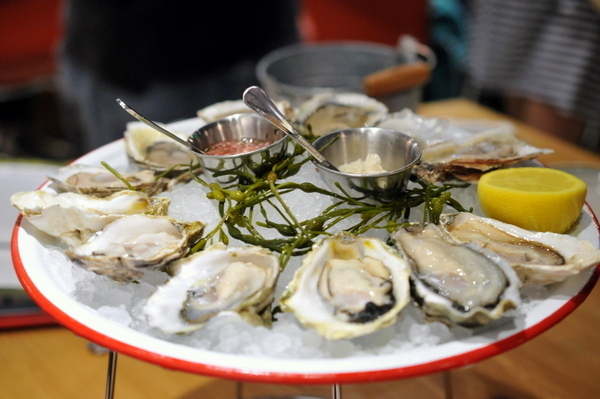 I ended up with: Hama Hama - creamy mouthfeel with saline balanced by citrus; Crystal Point - crisp muscular oyster with an intense brine; Eagle Miyagi - a medium bodied oyster with a lingering salty finish; Pemaquid - firm texture, with an overarching essence of seaweed; Wellfleet - concentrated salinity, with a lean texture; Tatamagouche - meaty and well balanced medium brine with a nutty sweet accents, the most nuanced of the six and my favorite of the bunch. 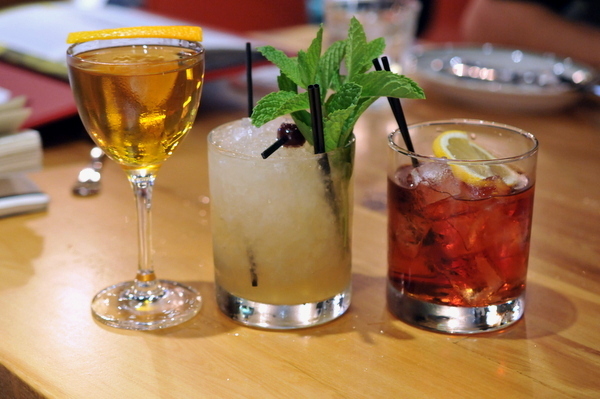 The second round of cocktails was definitely on the stiff side. First up, The Dickerson offered boozy heat mixed with a candied sweetness reminiscent of an apricot Jolly Rancher. 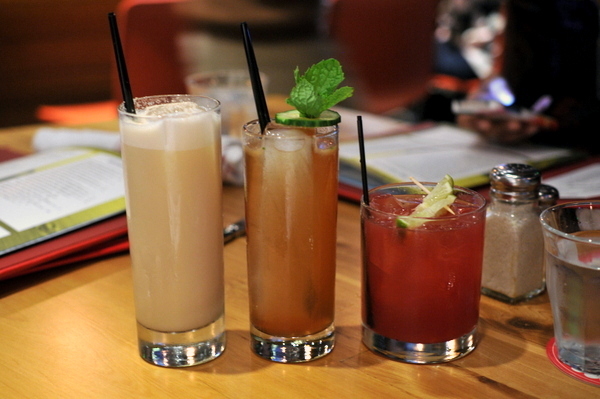 The Catalina Eddy had a tropical complexion of banana and coconut mixed with the heft of the rum. The gin was quite prominent in the Royal Treatment with a touch of bitterness and citrus-y zest. 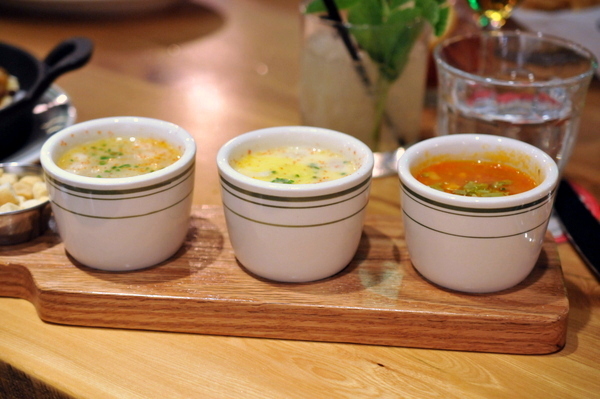 Naturally we had to try all three types of chowder on offer. 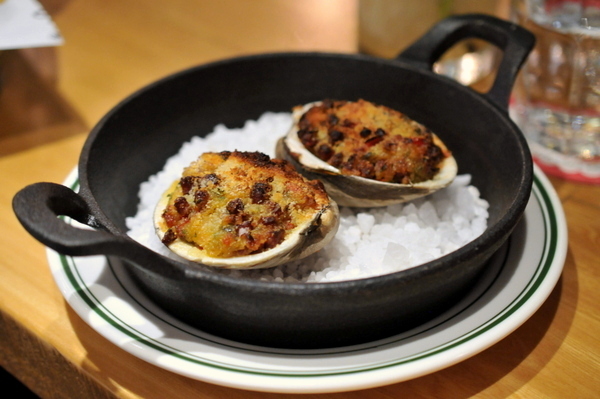 The classic New England-style was buttery and rich though kind of light on the clam flavor. I've never been a fan of Manhattan chowder, and this won't be the cup that changes my mind, thinner with an acidic tang thanks to the tomato based soup. Ironically it was the obscure Rhode Island clear that proved to be my favorite with the most pronounced clam flavor of the trio. The Stuffies are classic New England fare, the spicy meaty heft of the sausage was delicious but also overpowered the clam. A very well executed version of fried calamari. The batter is light but crisp and full of fried savor while the squid beneath was supple with a light touch of salinity. 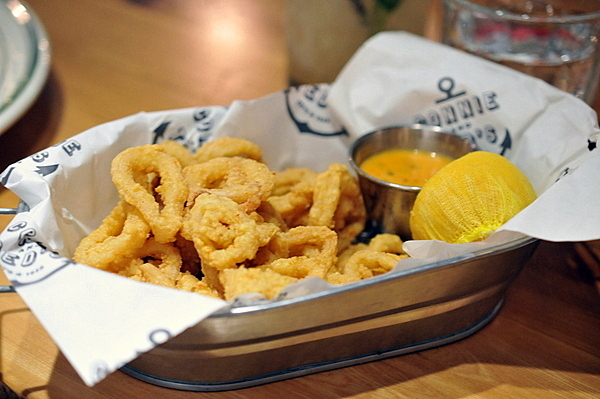 A splash of lemon juice or the spicy tang of the Figeroa made the fried squid even better. 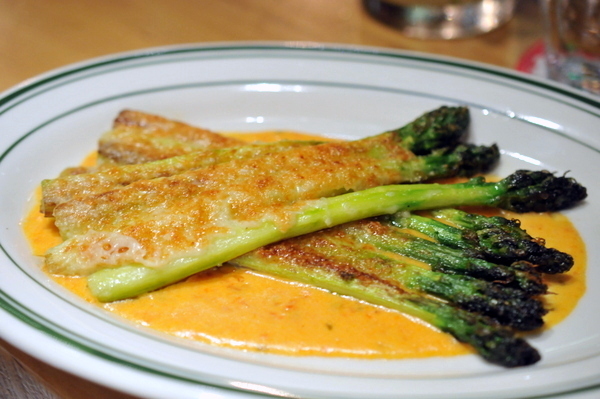 The asparagus was one of the unexpected treats of the night. The tender spears had a light vegetal bitterness that contrasted nicely with the rich zest of the Parmesan and the spice of the velvety Figeroa. Another classic fried New England treat, while I thought the puffed morsels had a bit too much batter but the bits of clam were quite tender. 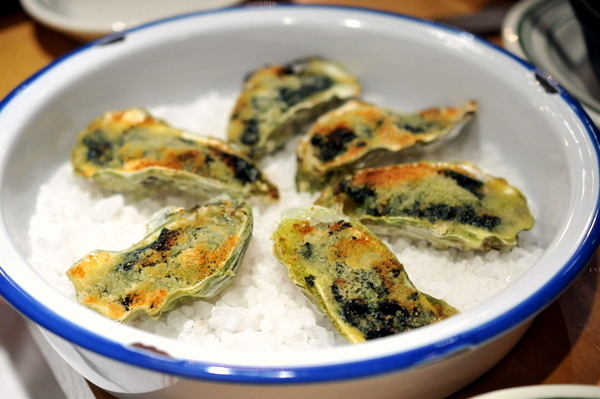 Though I typically prefer my oysters raw, the Oysters Rockefeller have their own charms, creamy and rich but balanced by a bitter counterpoint from the spinach and a light toasty crunch from the charred breadcrumbs. 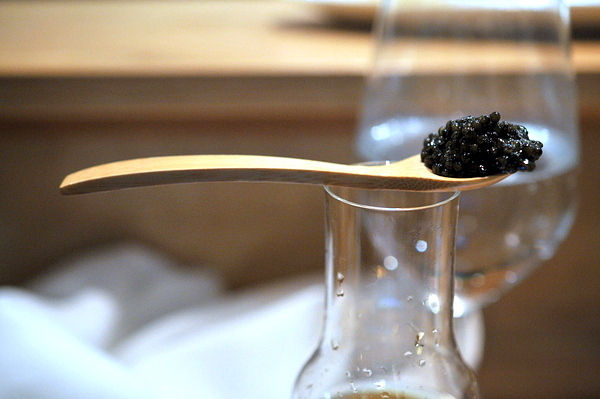 I first encountered this course at Providence and it was every bit as delicious this time around. The surface of the scallop is nicely scorched but the interior remains raw with a delightful jellied mouthfeel. 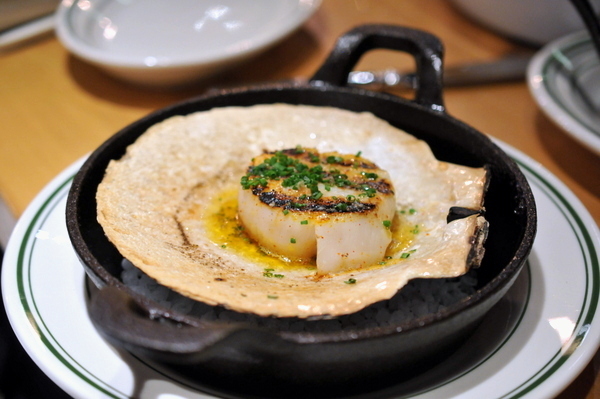 The scallop's intrinsic sweetness is nicely embellished by the heady aroma of melted butter. Not really sure if I could picture a sailor drinking the Sailor's Delight, the sweet juicy libation has a nice frothy topping of whipped egg white and a vivid strawberry aroma so intense that I couldn't even taste the alcohol. The Narragansett was equally easy drinking with gentle notes of citrus and wood, the lightly effervescent drink is wonderfully refreshing. The deviled oysters were the best of the three cooked presentations, unlike the Rockefeller, the salinity of the oyster was especially prominent even among the creamy spice of the sauce. 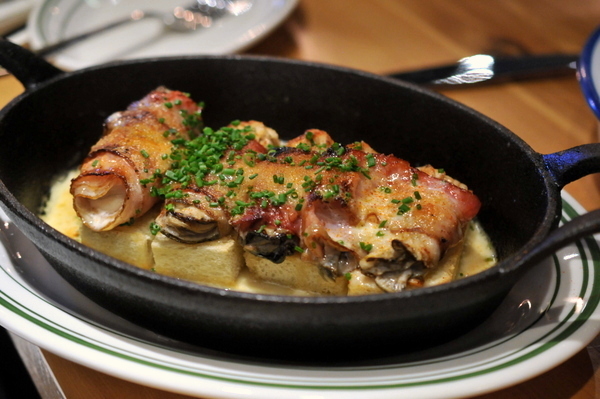 Originaly an appetizer from the UK, the fancifully named Angels on Horseback involve wrapping oysters with bacon. The result is a lusty smoke filled salinity that can be a bit blunt though the tangy cream sauce did help matters somewhat. 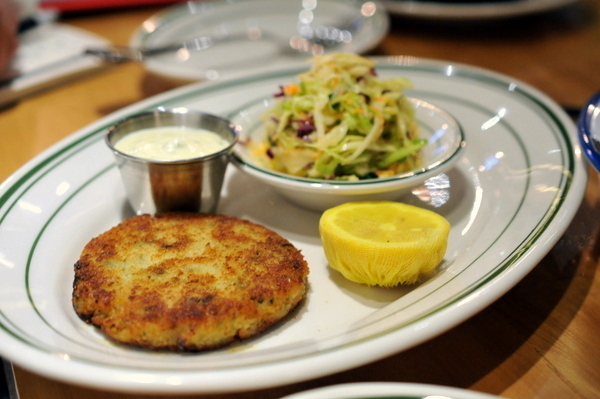 The crab cake looked a bit insubstantial but the flavor of the peekytoe crab was actually quite clear-cut while the fresh tangy slaw provides a nice lift from the fried weight of the crab. 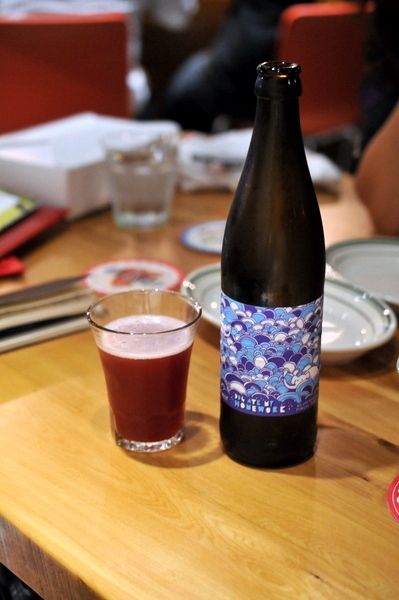 I was expecting something sweet but despite the dark red color and subtle aromas of blackberries the beer had a dry yeasty complexion on the palate with grape-y vinous notes on the finish. 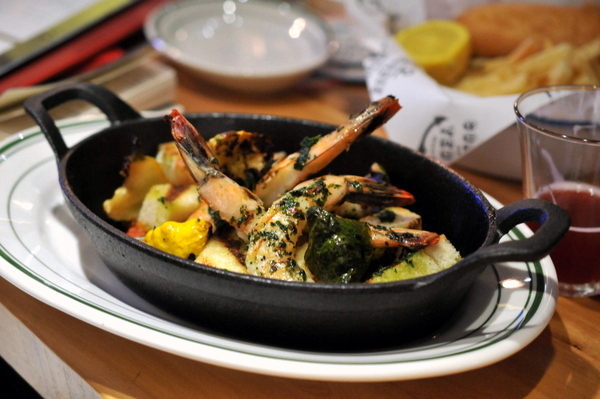 The shrimp were grilled beautifully, still retaining a crunchy snap and an intense saline sweetness augmented by flavors of garlic and butter. 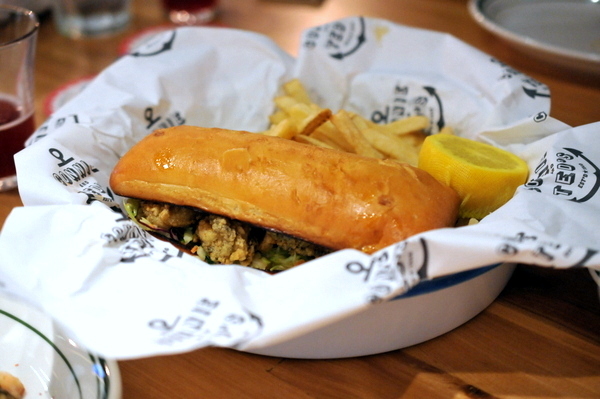 The fried oyster sandwich proved to be quite the treat. 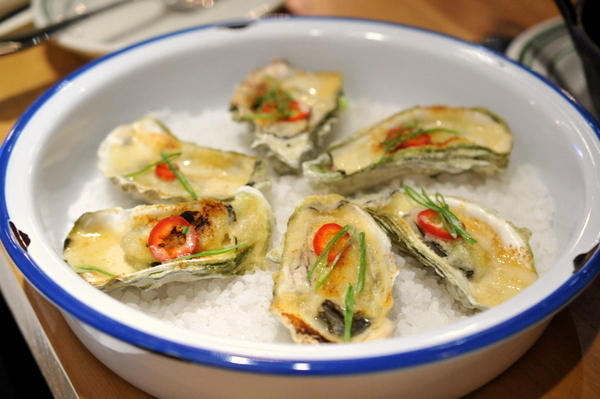 Under the crisp batter, the oyster have softened giving the bivalves a lush almost creamy disposition. The cole slaw, mayo and the sweet house-baked bread were all lovely accompaniments to the tasty fried treats. 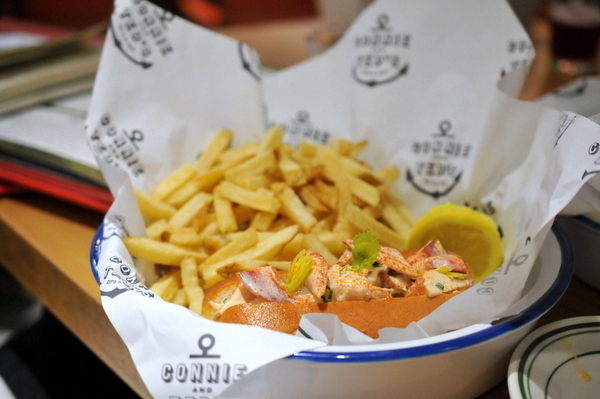 No visit to a New England seafood joint would be complete without trying the lobster roll. This was a pretty spot on presentation with generous chunks of cool snappy lobster meat that was by turns sweet, savory, and even a little spicy. The meat is covered in a light layer of velvety mayo while a handful of celery leaves adds a bitter herbaceous counterpoint. An airy buttery roll wraps everything together into one cohesive package. 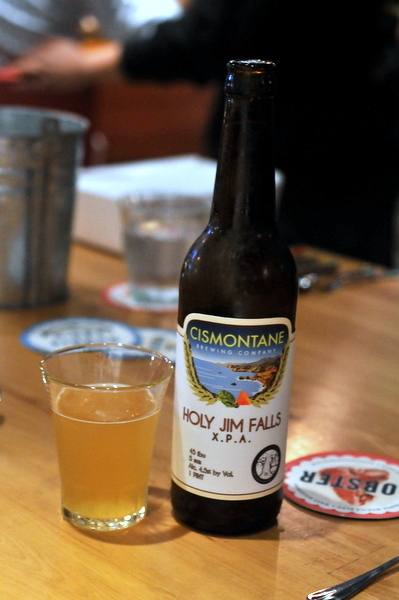 This was a fantastic beer, light and crisp with a lemonade like attack but plenty of herb-y hops on the finish. 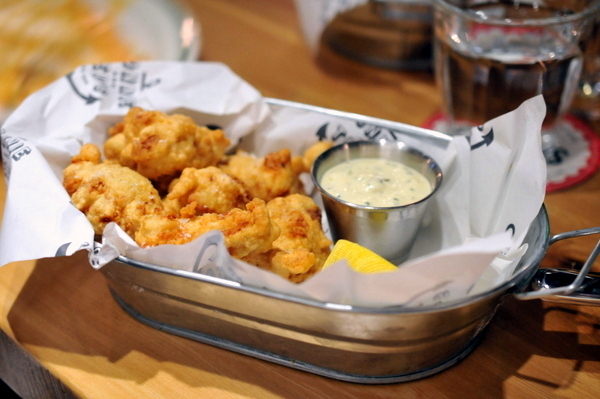 Like the lobster roll, we absolutely had to try the catch of the day. We opted to have the plain and simple preparation as we wanted to be the star of the dish and boy was it ever. The purity and character of the cod abounds in the saline essence and plump translucent flakes of sublime and supple fish. This dish looked awesome on the menu but I found it a bit underwhelming. Though I'm normally a fan of potatoes I found their hearty starchy heft a bit blunt and the tomato based sauce was a bit distracting from the shellfish. Like the preceding dish this was a hearty stew-like mixture but I thought the flavors of the seafood were more apparent here. While the seafood was enjoyable, for me the best part of the dish was the broth, that distilled the multifaceted essence of the shellfish into a heady bisque-like elixir. 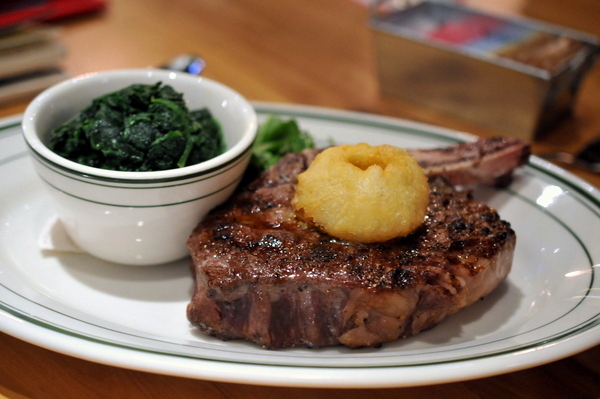 While Connie and Ted's is primarily a seafood restaurant they do offer a couple of steaks as well. One of my companions is diabetic and opted try the rib eye instead of dessert. 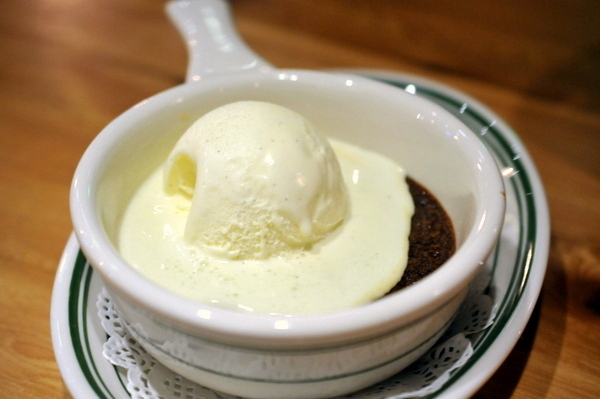 This classic homespun dessert felt right at home on the dessert menu at C&T. 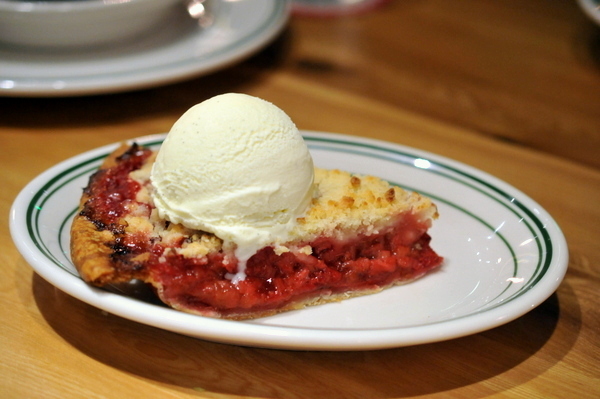 Simultaneously redolent of tart rhubarb and strawberry jam and wrapped in a deliciously sugared crust. 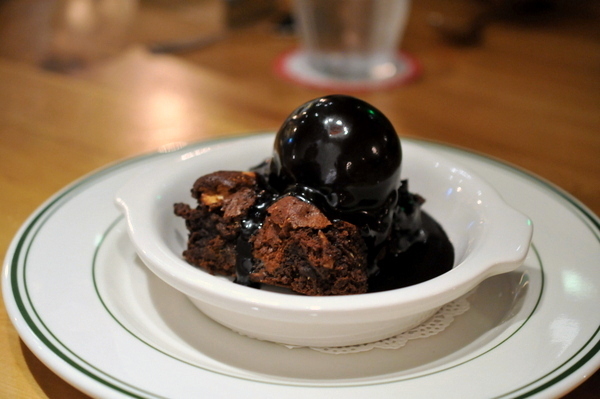 Composed of dense rich brownie, cool chocolate ice cream, and a pitch black fudge sauce, this dessert is a chocolate lover's dream. A bit overly heavy for my tastes, though the bits of nuts help break up the monolithic heft of the chocolate troika. Made from cornmeal this dessert had a weighty Autumnal spice to it; enjoyable but not really my kind of dessert. When Cimarusti came by our table he insisted that we try his wet nuts explaining that they were a childhood favorite of his. 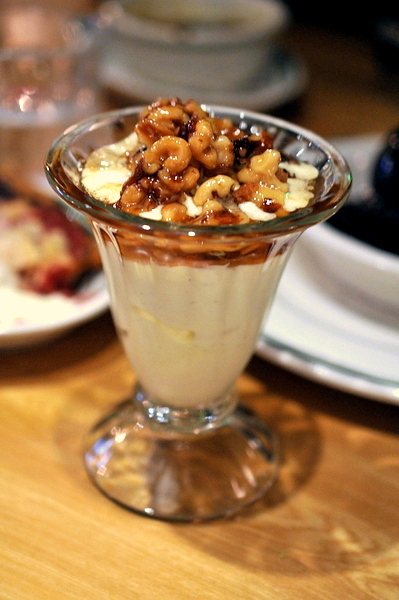 Wet nuts are a common dessert topping made from walnuts and maple syrup; warm soft and oozing maple goodness the walnuts were tasty though I don't know if I'd call this a must order. 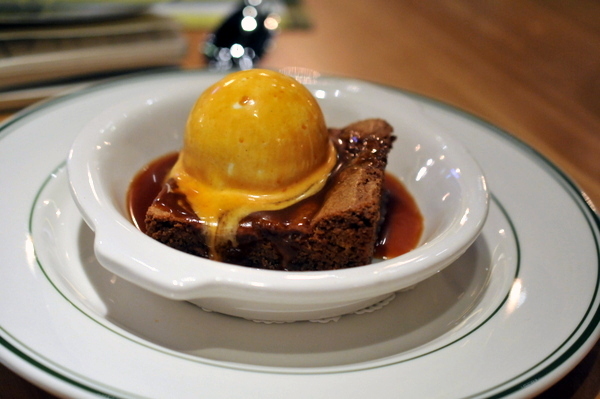 Another suggestion from the chef, this was hands down the best dessert of the night. Texturally the blondie has a nice crust and moist dense interior with a salty-sweet balance that makes this dessert truly shine. 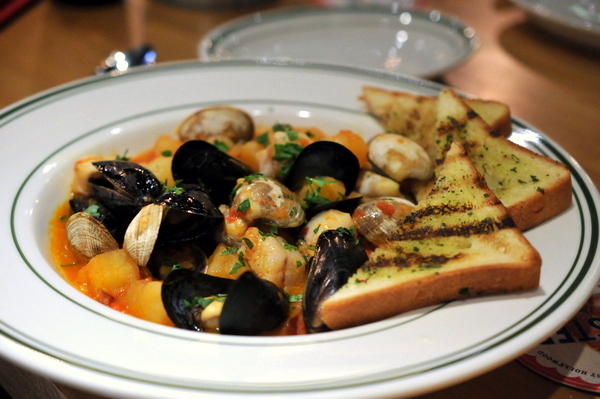 When I first heard that Michael Cimarusti was opening a casual New England-style seafood restaurant I wasn't sure what to think. Given the style of cooking he was doing at Providence this seemed like a step back in terms of ambition and complexity but at the same time I could appreciate his desire to honor his roots and pay homage to the cooking that first inspired him. It goes without saying that the seafood at Connie and Ted's is superb, the classic dishes give the place a soulful comforting feel yet everything is executed with the utmost precision and skill one would expect from Cimarusti and his team. There were a couple of service issues and pacing was a bit off but I suppose they can be forgiven considering it was opening night and the place was packed the entire time. With its combination of profound yet approachable flavor I suspect a seat at Connie and Ted's isn't going to be easy to come by for quite some time.